Thousands of comic fans are descending on a small Cumbrian town this weekend for an international festival. Among them will be a growing number of academics who are now taking the art form - previously regarded by many as "throwaway" - as seriously as other literature. With Batman, Superman and The Avengers dominating box offices after making the leap from the page to the big screen, comic-inspired characters have been making a comeback for years. But it is not just cinema-goers who are drawn to the exploits of cartoon creations. 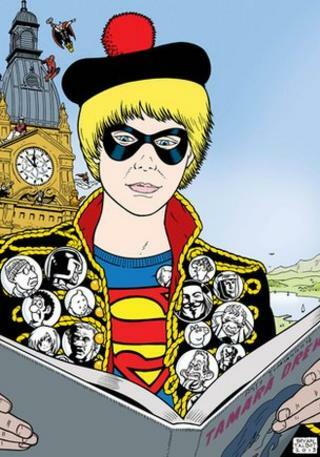 Academics are also taking an increasing interest in the world of comics and graphic novels. There are now thought to be about 150 comic scholars in the UK - university lecturers, PhD students and independent researchers. They are exploring how subjects such as gender, feminism, history and mental and physical health are portrayed. Dr Mel Gibson, a comic book expert at Northumbria University, said the genre had "matured" in the 1980s, mainly thanks to British writers such as Bryan Talbot, Alan Moore and Grant Morrison. "That's also when academics got involved. But it's not ivory tower stuff, it's rooted in the real world. It has practical applications," she said. Dr Gibson is one of 50 leading figures from the world of graphic novels who will be appearing at the inaugural Lakes International Comic Art Festival in Kendal from Friday until Sunday. With writers, artists and industry figures coming from as far afield as Japan, the United States and Scandinavia, the event promises to transform the picturesque Cumbrian market town. While there are still only a handful of courses across the UK dedicated solely to comics and graphic novels, Dr Gibson says they find their way into many traditional undergraduate subjects. "Some of my final-year students are looking at children's literature and as part of that they will explore comics and graphic novels," she said. "They can even be included in social work studies and paediatric nursing - Bryan Talbot's The Tale of One Bad Rat has been used by health professionals around the world dealing with people who have suffered childhood abuse. "The victims might not want to or be able to talk about their situation, but through the story they can begin a discussion. That's a valuable tool for a health worker to have in their arsenal." The Tale of One Bad Rat, written in 1994, tells the story of a girl who flees London to escape sexual abuse at the hands of her father. "That is the graphic novel I'm most proud of," said Talbot. "I still get people today writing to me to say they were abused and that the book helped them cope." The 61-year-old - a founding patron of the Lakes event - is a doyen of the comic art world. Originally from Wigan, he has lived in Sunderland for the past 15 years with his wife Mary, an academic-turned-graphic novelist, and the pair won the Costa 2012 biography prize after teaming up for Dotter of Her Father's Eyes. It was with one of the first British graphic novels, The Adventures of Luther Arkwright, that Talbot made his name in the late 1970s. A story of parallel worlds, it features several nods to the poet William Blake. More recently, 2007's Alice in Sunderland explored the links between the North East city and author Lewis Carroll, mixing myth and history along the way. In recognition of his work, Bryan was given an honorary doctorate by Sunderland University in 2009 while last year he was presented with an honorary degree of doctor of letters by Northumbria University. "Academic interest has grown over the years and I'm proud," he said. "Someone once sent me a PhD thesis they had written about Luther Arkwright and its historical elements. "When I started working in comics it was almost like working at the bottom of the artistic barrel. To most people they were only just more interesting than patterned toilet paper. "Steadily they gained credibility, but that's down to the talent of the writers and illustrators. If the novels weren't any good then no one would be taking any notice of them." Taking inspiration from the annual Angouleme International Comics Festival in France - which draws 250,000 fans - the Lakes event will feature ticketed exhibitions, workshops and panels, as well as a programme of free family-friendly events. Venues across the town will stage sessions, shops are displaying artwork by schoolchildren and college students while the town hall will even replace its Union flag with one bearing the Batman logo. Talbot's latest work, again in partnership with his wife Mary, as well as illustrator Kate Charlesworth, is Sally Heathcote: Suffragette - a tale following a maid-of-all-work and the fight for the vote in Edwardian Britain. For academics such as Dr Gibson, gender is a key area of study. "Sally Heathcote is an example of a strong central female character - something comics are now very good at," she said. "For a while it was forgotten that girls read comics, much less that they were represented within them. "In the 1960s publications such as Jackie featured comic strips, but they disappeared over a period of 20 years and those titles began to steer girls towards magazines like Cosmopolitan rather than comics, which is different to the way boys' reading patterns were shaped." For Dr Gibson the move from a niche, underground offering to graphic novels being seen by many as having mainstream educational appeal is a welcome one. "Graphic novels were once seen as throwaway, but now they are more highly valued and viewed as things which deserve space on the bookshelf."